To query the foreign priority date use the PRIR field code. The example above looks for documents that have priorities dates of Januay 20, 2010. Notice the format in the search field (1). The date you search for needs to be in the YYYY-MM-DD format. This is the date format (2) listed in the priorities tab (3) of the Document Details window. 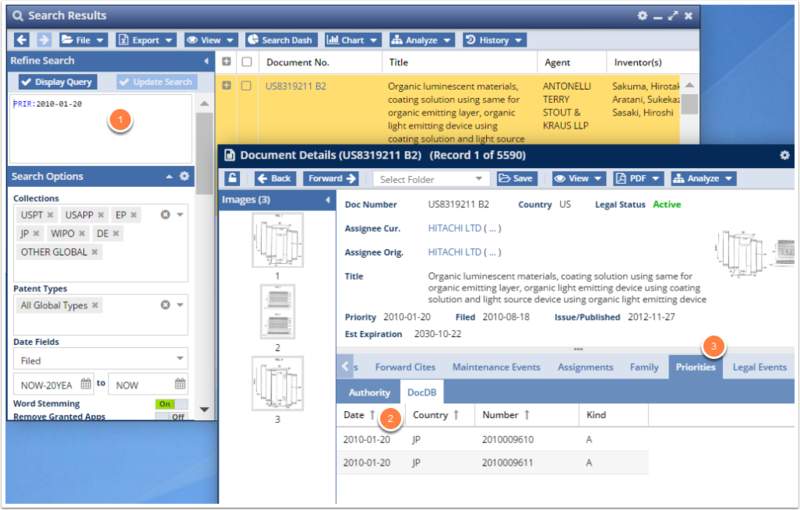 PRIR:2011-03-02 --> Finds all documents with an included priority date of March 2, 2011. PRIR:"2011-03-02" --> Finds the same document set as the previous example.